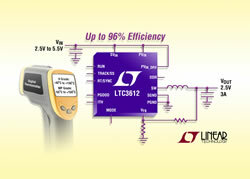 Linear Technology released high reliability (H-grade) and Military (MP-grade) versions of the LTC3612. This is a high efficiency, 4MHz synchronous buck regulator that incorporates a constant frequency, current mode architecture. The device can deliver up to 3A of continuous output current at output voltages as low as 0.6V from a 3mm x 4mm QFN or a thermally enhanced TSSOP-20 package. The LTC3612 operates from an input voltage of 2.25V to 5.5V, making it ideal for single cell Li-Ion applications as well as 3.3V or 5V intermediate bus systems. Its switching frequency is user programmable from 300kHz to 4MHz, enabling the use of tiny, low cost capacitors and inductors. The high reliability H grade versions are guaranteed to meet specifications over the -40°C to 150°C operating junction temperature range. The LTC3612HUDC is available in a 3mm x 4mm QFN-20, and the LTC3612HFE is offered in a 20-lead, thermally enhanced TSSOP package. The military MP grade versions, the LTC3612MPUDC in QFN and LTC3612MPFE in TSSOP, are guaranteed to meet specifications over the -55°C to 150°C operating junction temperature range. Pricing for the H-grade starts at $3.95 and $4.15 each, respectively in 1,000-piece quantities. The MP-grade are priced at $9.85 and $10.40 each, respectively in 1,000-piece quantities. All versions are currently available from stock supplies. For more information, and links to the data sheet, visit the LTC3612 product page.